Central Florida Community Arts’ (CFCArts’) Legacy! will proudly present a full-length musical production, One: An American Portrait. This group of industry professionals and talented artists will present a multi-media experience traveling throughout the history of America, projecting snapshots of our country from various time periods. From the Andrew Sisters and their “Boogie-Woogie Bugle Boy” to the “Age of Aquarius” in the rockin’ 60’s and great American classics of pop and patriotism, they will visit the people and moments that have made this country great, all while honoring the men and women who sacrificed so much to make those moments possible and celebrating our triumphs and struggles that have ultimately united us as ONE. 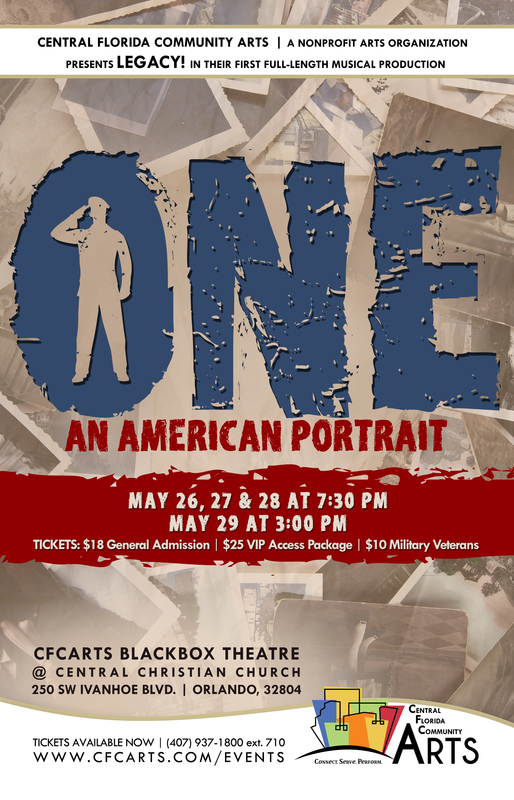 One: An American Portrait will be performed at Central Christian Church, 250 SW Ivanhoe Blvd., Orlando, FL 32804, at 7:30pm on Thursday, May 26th, Friday 27th, Saturday 28th and Sunday the 29th at 3:00pm. General Admission tickets are $18. Priority seating will be offered for this production, tickets are $25.00, and will include reserved seating, with special reception with performers. As a tribute to our honored guests, veteran tickets will be $10.00. Door open 30 minutes prior to show and tickets will also be sold at the door. 2 weeks ago by cfcarts The CFCArts Big Band is ready to have a good time at Spring Swing this weekend - are you ready?! 4 weeks ago by cfcarts We’re at #ipucf looking for some amazing interns to join our team!